Let us go back many years to when I was beginning photography. This image to this day is still one of my favorite photos. I even have it enlarged as a canvas print in my office. Many of my brides at one time were bridesmaids in a wedding, this was the case with Amy as well. I met Amy at her brothers wedding just a couple of years before. It has always been important to me to build a relationship with everyone who is involved at a wedding, because many of them hire me in the future for their photo needs. This image was one of the very first in motion photos I captured. I was so excited after I hit the shutter and what came up next on my camera. I knew right then and there that I had captured a photo that not only would be timeless for my clients but for my portfolio as well. The architecture in the Bozarth Mansion wedding venue, in Spokane, Washington is beautiful and timeless as well. I remember sweating bullets when I took this shot. It was a very hot August day, which in the inland northwest seems much hotter than it usually is. As I am writing this I am still so pumped many years later that this image still makes me gasp a bit. 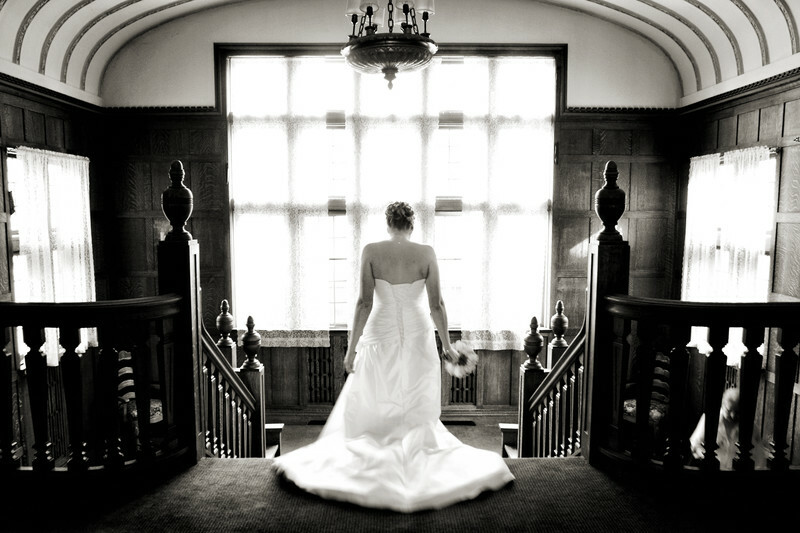 The way the dress almost looks liquid as it flows off the bride walking down the stairs. The way the light off the large window lights the stairwell makes me wonder how many other people have taken a photo in this same exact spot and were bewildered. Not often do I carry a tripod along with me when I am shooting weddings, but when I do, its for moments like these that truly mean a picture is 1000 words. Location: Bozarth Mansion Wedding Venue. Keywords: bozarth mansion wedding venue (3).